The Rt. Hon. 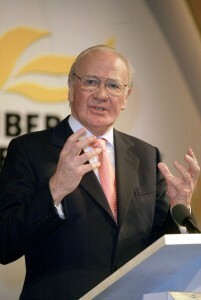 Sir Menzies "Ming" Campbell CBE QC M.P. (to use his full title) is the new leader of the Liberal Democrats after one of the funniest and most farcical leadership elections in British politics. But now, "Ming the Merciless" has a real dilemma to face: where to take the party now? The Liberal Party was always the voice of the middle-of-the-road, tolerant (somewhat wishy-washy) middle-class. However, it became increasingly out of touch with the indcreasingly empowered working class, prompting the rise of the Labour Party, and the demise of the Liberals as they were then. The formation of the Social Democrat Party was a short Liberal rennaissance, but didn't last very long. The Liberal Democrats are the new incarnation for Liberals. Whilst the party ideologies used to be very clear cut - with the Tories on the right, supporting the rich and big business, and Labour on the left, supporting the trade unions, and putting forward left-wing, socialist policy. The Lib Dems began by shooting up the middle of the political spectrum. However, the fight for the centre-ground, the Lib Dems' traditional heartland, is far more competitive. With Blair's "New" Labour and Cameron's "Compassionate" Conservatives, it seems that there is little room for a third centre party, but as Simon Hughes pointed out at the leadership hustings in Cambridge, which Londonist attended, the Lib Dems "were there first". This is their territory, and know how to fight it. This is perhaps why they now have 63 M.P.s - they have more experience at fighting centre-ground poltics. However, after last year's general election, the party seemed to disappear from the headlines, with very few new policies and no definite drive or direction. Many of the party's M.P.s started to get impatient, hence the deposition of Kennedy. Campbell's challenge as leader therefore, is to give the party a firm direction with his new shadow cabinet and policies. It seems so far that he is taking the centre-left approach, which seems pretty shrewd, seeing as Labour and the Conservatives seem to be taking a centre-right approach. Campbell has also appointed bright young things Chris Huhne and Nick Clegg to top posts in his new shadow cabinet. Fresh from their spring conference at Harrogate, the Lib Dems are a very exciting party at the moment - they have had an inordinate amount of press coverage over the last few weeks - not all of it good, but it has certainly put the party on the map. The Liberal Democrats are truly the party to watch.